HPC is honored to announce ComEd Energy Efficiency Program and Franklin Energy as our host sponsors for 2019 National Home Performance Conference and Trade Show at the Sheraton Grand Chicago, April 1-4. It has been far too long since we’ve held our national gathering in one of America’s great cities—in fact, the last time we had our conference in Chicago was back in 1997! We’re thrilled to be back again—22 years later— to provide the best educational agenda in home performance and weatherization, our industry’s largest trade show, and networking opportunities that will boost your business. 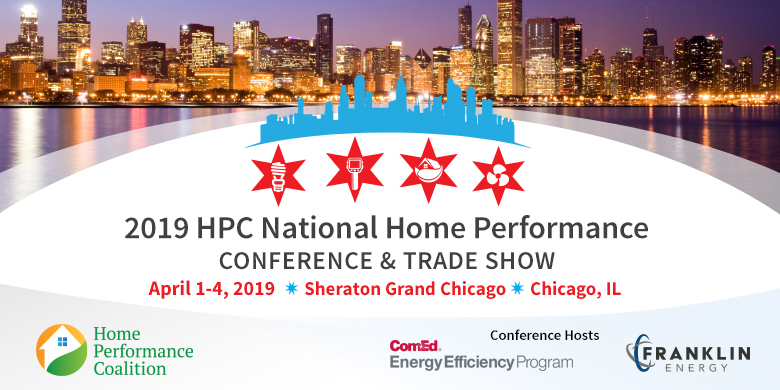 "ComEd is excited to co-sponsor the 2019 National Home Performance Conference because we share the same vision of making homes energy efficient and comfortable with affordable solutions. We believe everyone has an equal right to safe, reliable and affordable energy and The ComEd Energy Efficiency Program puts those beliefs into action. The HPC conference helps strengthen the energy efficiency community by bringing together home performance professionals who share ideas and make connections for a more sustainable future." "As we all work to improve the energy efficiency of our buildings and sustainability in how we live, the HPC 2019 conference is a great opportunity for professionals from all backgrounds to come together and learn how they can make an impact. With their drive to promote healthy and efficient homes for homeowners, and support contractors and manufacturers specializing in home performance, the Home Performance Coalition is a critical organization in our industry." The ComEd Energy Efficiency Program helps customers reduce their electricity usage through instant discounts, rebates, energy assessments, technical services, and whole-building solutions. Residential, commercial, industrial, and public sector customers have saved more than $2.95 billion since the program’s inception in 2008. ComEd partners with trained Energy Efficiency Service Providers who help residential customers take the next step in improving home performance by installing energy-efficient HVAC equipment and weatherization improvements. Franklin Energy is a leader in energy efficiency, demand response, and other distributed energy resources, through both organic growth and acquisition. They partner with utility, state and municipal clients nationwide and into Canada to create lasting, measurable change. Franklin does that through their turnkey demand side management and education programs for residential, multifamily, small business, agricultural, and large commercial and industrial markets. Together, we networked, learned, laughed and grew. The 2018 National Home Performance Conference & Trade show was a tremendous success.